Historic New England is restoring a purple couch that long sat in the stairhall at Otis House. 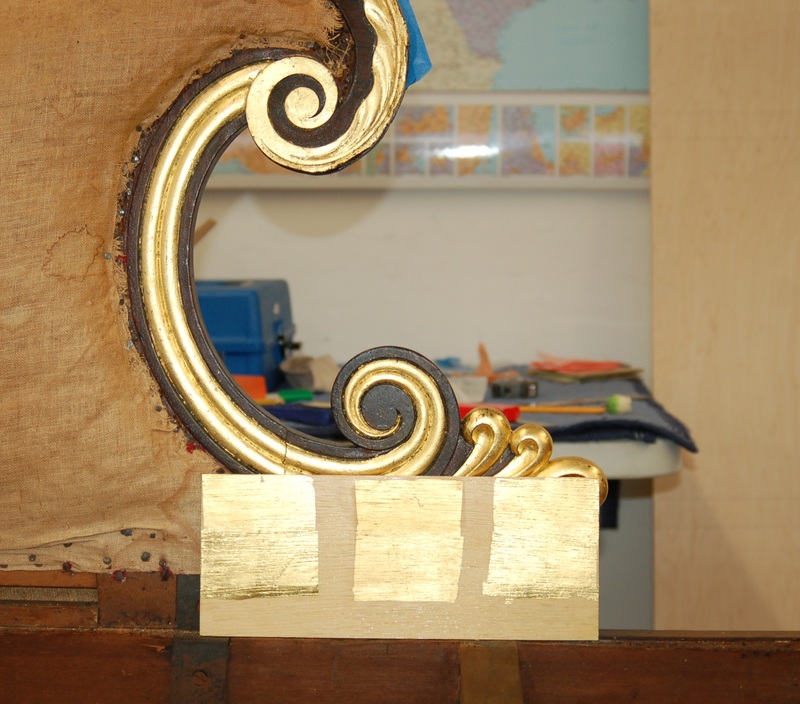 The second phase of this project involves re-gilding the passages on the arms and back of the couch that were signed by famed nineteenth-century carver Thomas Wightman. After cleaning the surfaces to remove years of dirt that obscured the grain painting, conservation staff applied a barrier layer. The barrier is soluble in solvents that do not affect the original grain painting, providing a reversible layer in between the original material and any fills, inpainting, and gilding applied during the treatment process. This coating saturated the degraded coating on the wooden surfaces, reviving the color and detail of the grain painting. Staff carefully examined the couch to determine the locations of the original gilded passages. 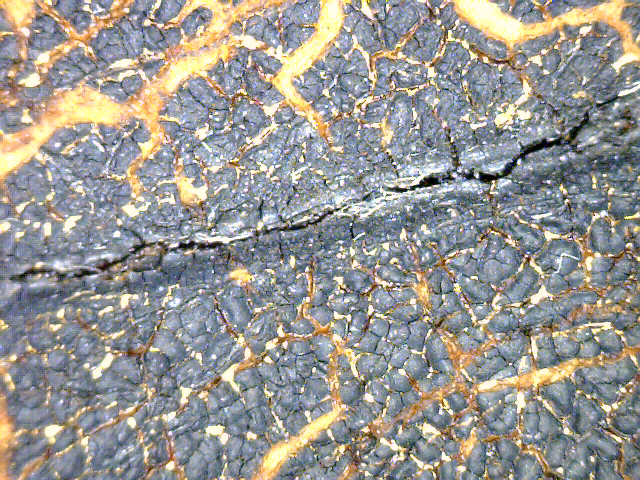 A later paint or pigmented varnish applied to these areas severely obscured their appearance, and in many cases the gilding could only be seen in the cracks of the varnish. Cleaning tests performed early in the treatment determined that the removal of this dark layer would cause high risk of damage to the original gilding below. We also decided to retain the history of the alteration, because it shows how tastes in style changed over time. For example, Boston style in the nineteenth century was known for being a bit more reserved than the gaudy gilded styles of Philadelphia and New York. It is possible that the dark coating was applied to make the piece more appealing for a Boston market, a theory further explored in an upcoming exhibition catalogue by Robert Mussey and Clark Pearce. Gilding over the identified areas presented a series of challenges, aesthetically and chemically. The darkened varnish layer created a very unpleasant crocodile pattern that did not fairly represent the original design of the gilded surfaces. We chose a reversible fill material to help partially level the surface. This layer was then sealed with the same barrier coat that was applied before. The mordant, or adhesive, for the gilding needed to be soluble in solvents that do not affect the barrier coating while still having ideal working properties. This limited the adhesives to water-based materials (the barrier coating is soluble in most other solvents). A water-based mordant, however, would cause the gilding to become tacky with every increase in humidity, or if someone were to touch the gold for too long with bare hands. An additional toning layer, soluble in yet another different solvent, needed to be applied over the gold to seal it away from the fluctuations of the environment. We tested different media and pigments to determine the best combination that would most closely match the decorative brasses and create a cohesive appearance. While there is still much to be done on this project (replicating grain painting, coating and toning the brasses, and prepping for minimally intrusive reupholstering), the addition of the gold has been transformative. Stay tuned for more updates on the Wightman couch. Support the preservation of Historic New England’s one-of-a-kind collection by making a gift to the Collections and Conservation Fund.